With some very basic ingredients usually available at home, you can whip up some comforting simple lentil based sweet dishes that are not high in calories yet delicious. One such traditional Indian dessert is Pesara pappu payasam prepared from good quality yellow moong dal, jaggery and milk. This humble earthy sweet dish was part of our festive thali on Ugadi and what I really like is its subtle sweet flavor leaving you with a pleasant mouth feel. Cooked moong dal is simmered in milk and melted jaggery till well blended and flavored with cardamom powder and ghee toasted cashewnuts and raisins providing that crunch. Try it and you are assured of an absolutely delectable treat. Can be served either warm chilled. In the same pan, add the moong dal and roast it for approx 4 mts till a nice aroma emanates the kitchen and it turns a light brown shade. Remove from pan and pressure cook the dal till soft and mushy. Take a cooking vessel, add jaggery and water and boil till the jaggery melts (remove scum). Turn off heat. In a heavy bottomed vessel, boil the milk (1 1/2 lts), stirring once in a while and once the milk is boiled (it should reduce to a little over one litre), add the cooked mushy dal and combine well. Next, add the jaggery syrup and go on stirring on low flame till well blended for at least 12-15 mts. Add the cardamom pwd and toasted cashews and raisins. Serve warm or refrigerate until chilled. It tastes good both warm and chilled. ymmmmmmm…i liked ur recipe………i’ll do it today itself….i’m a new blogger. Yes this is familiar to me too. we call it ‘paasi paruppu payasam’.Sometimes my mom uses a little coocnut milk along with the regular milk to make this payasam. Very nice and simple recipe. Will try for sure. Moong dal ni pressure cook cheyatamu tip bagundi. Thanks for your recipe. Great recipe and thanks for taking me back in time…..this payasam invoked fond memories of my time in Bangalore…..Pesara Pappu Payasa or Hesarubele payasa-this one tastes divine. We too make on all festival days… in my house we add fried coconut piece. I’ve just found out about your website. Thanks for sharing not only food but also the rituals related to food. I’m really interested in rituals and have given a big importance for them on my last book, not only the food related rituals of my homeland Turkey, but also other cultures too. Hi Sailu, I have never made moong dal payasam. the pics looks so divine as always. nice simple recipe. wow it is very yummy. i prepared it just now, good to taste and aroma also fine. my family liked it. thanks for giving a good payasam recipe to us. Thanks for informing me, Sapna. Anuzi has taken care to credit the right source after she has been informed that thebmagazine has lifted that image from my blog. 1) Is it possible to substitute pressure-cooking with stove-top-cooking of the dal? I don’t have a pressure-cooker, but would like to make this dish. 2) That milk looks really beautiful – what kind is it? It looks almost beige in color, like unpasteurized milk. Yes, Tatiana, you could cook over stove top. Its normal milk and its the dal and jaggery which give that color. i soak a tbsp of rice and grind it along with coconut. i add it to the milk and boil for some time before adding moong dal. Your preparations are very attractive and simple. I have many of them and have loved the food. However, when I tried this dish, Pesara Pappu Payasam, the milk split after cooing and sadly we had to throw it all away. Can you suggest what went wrong here? How do I correct it next time? Sailu, I sent a mail to your gmail ID and it bounced. I wanted to add the event that I started in TASTE OF INDIA event calender. How do it do that? Hey Sailu, Lovely blog. Can I get lucky enough to get included in your blog roll pls? Your recipes are mouthwatering and simple. Thank you for making our cooking easier. 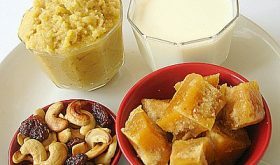 hi this is yet again lovely receipe from you, am going to try tonight..
will try the payasam recipe for sure…. your recipes are mouth watering and very nice recipes. i’ve found ur website.ur recipes are simply super.thank for giving us. Deepa please share your blog…lets us enjoy your blog also……. In how many whistles, it gets cooked? Also do you strain the syrup? Two whistles is enough. Yes, strain the syrup.